Properties in North Carolina average 4.6 out of 5 stars. AMENITIES near Ft. Bragg! Don't miss 2 br! Property 4: AMENITIES near Ft. Bragg! Don't miss 2 br! Lakeside cozy 2 Bed/2 Bath condo on a Greenway. Property 6: Lakeside cozy 2 Bed/2 Bath condo on a Greenway. Located in the heart of "Mayberry"
Property 11: Located in the heart of "Mayberry"
A authenic early American cabin located on a eighty acre farm in NC Foothills. Property 12: A authenic early American cabin located on a eighty acre farm in NC Foothills. Peaceful lake front property on quiet cove. Pets negotiable. Property 15: Peaceful lake front property on quiet cove. Pets negotiable. Property 18: Couples Retreat with breathtaking mountain views!! Listen to the waves! View from 2 levels! Gorgeous sandy beach! 2 pools! Property 22: Listen to the waves! View from 2 levels! Gorgeous sandy beach! 2 pools! Property 25: Farm Animals! Quaint Mountain Cabin! 74 Acres of Private Hiking! Walk to DuPont Forest - New cabin designed for relaxation and comfort. Property 26: Walk to DuPont Forest - New cabin designed for relaxation and comfort. Oceanfront condo in Duck! Stunning sunrises and unobstructed sea views! Property 30: Oceanfront condo in Duck! Stunning sunrises and unobstructed sea views! Property 31: New!!! Tiny House Cabin Adventure on the River!!! Wifi and Firepit/free wood!!! Private Garden Cottage located in the heart of Historic Southport. Property 35: Private Garden Cottage located in the heart of Historic Southport. Charming Apartment 1 Minute to Everything! Property 38: Charming Apartment 1 Minute to Everything! 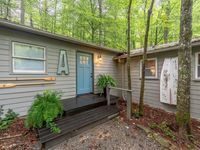 Property 41: Cozy Bryson City Cabin - 2 Miles to Downtown! Amazing long-range views, walk to town and restaurants. Feels just like home! Property 44: Amazing long-range views, walk to town and restaurants. Feels just like home! Historical guest house featured on HGTV's Beachfront Bargain Hunt Renovation! Property 45: Historical guest house featured on HGTV's Beachfront Bargain Hunt Renovation! Come enjoy the GORGEOUS views and the comforts of home! Property 49: Come enjoy the GORGEOUS views and the comforts of home! We stayed at the cottage in Brevard so I could ride the &quot;Assault on the Carolinas&quot; bike ride that has been held in Brevard for the last twenty years. The mountains were TOUGH but the ride was great. The cottage is so convenient to downtown it enabled me to just ride down Main Street to the starting line. The cottage is tiny but adequate for everything. The King-sized bed was fine with plenty of pillows. We would have preferred to have a dishwasher but we actually dined out most of the time in Brevard's fine restaurants. The only negative was the barking of the dog next door to the cottage. Susie should speak with the resident about that. We will most likely be back to the cottage in the future. Couldn't have asked for a more welcoming family. Fresh brownies, farm raised eggs and a clean home for us guys. They opened their farm up to us to enjoy it has everything they had to offer. Most importantly it was located in a perfect spot for mountain biking or touring the state forests. Convenient to both local towns, we will go back! Thanks!